Start Something New. Start a new drawing, make a new section, create a new project, paste from the clipboard or import an image, or take a quick picture for later markup. Breadcrumbs. You’re now in the Gallery, in the “Artwork” project. Tap this to bring up a list of your projects, tap a project to go straight there, and tap+hold a project to reorder it in the list. 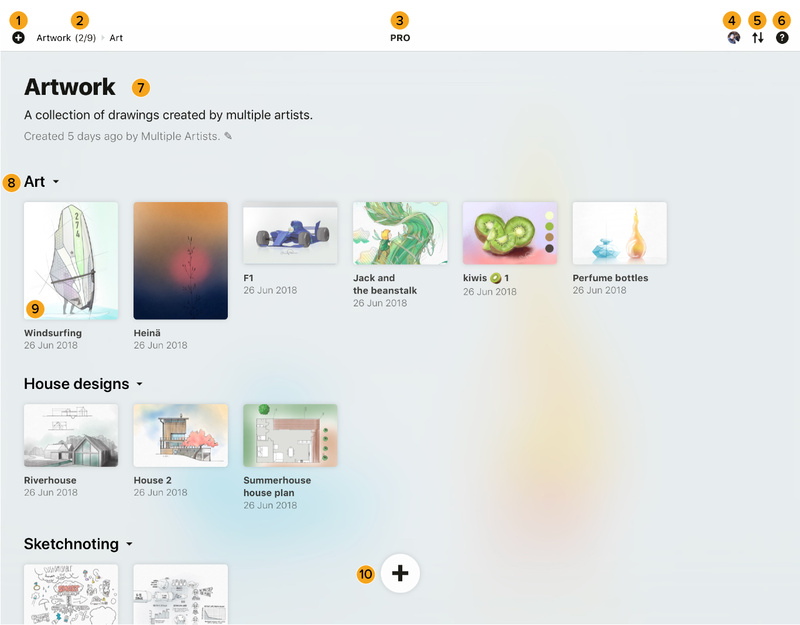 You can also tap+hold+drag multiple drawings, and add them into a project here. You can also slide your finger on the breadcrumbs to quickly scroll through projects. Your Account. Tap for preferences. Sorting. You can sort drawings manually, or automatically by date created, updated, or alphabetically. Help. Always available with a tap. Project Meta. Tap to change. Sections You can organize your drawings into Sections for portfolio, confidentiality, and general organizational purposes. These are hidable if you tap the arrow. Tap+hold a section title to rename or delete it, and tap+hold+drag a section to rearrange it. Drawings. All of your drawings in this project. Swipe right/left to switch between projects. Tap+hold a drawing to drag it about, duplicate it or delete it. Tap the drawing name to rename it. To page between projects, swipe left and right using one finger, or use the project scrubber in the status bar. To see all your drawings in a project, scroll up and down with one finger. To open a drawing, just tap it. To delete or duplicate a drawing, tap+hold it, then let go. You’ll see a popup appear with several options. To restore a deleted drawing, shake your device to Undo. To renamea drawing, tap the drawing name. To move a drawing, either inside a project or to a different project, tap+hold to pick it up, then drag it where you want it to go. Note that this will switch your sorting mode into “Manual”. To sort your drawings via another mode, find the Sorting button (aka two arrows icon) in the status bar. Each project has its own information that’s useful for organizing, searching, and keeping things straight in your head. On iPad, this is on the left side of the drawings; on iPhone, it’s above the drawings. Tap any field to update it. You can set a location for the project manually or automatically (handy for remembering a build site or where you came up with your idea). You can set it by tapping the location button in the project meta editor, which starts as “Unknown.” You'll see a blank line that can hold whatever location you like, or you can opt to set the location automatically. Tap the crosshairs to enable it - you'll see a prompt that asks if it's okay for us to use your current location. We respect your privacy. If, for some reason, you hit “Don't Allow”, you can re-enable it in the Settings App → Privacy → Location Services → Concepts. It's worth noting that enabling automatic location recording will start tagging every new drawing you make with your current location. Of course, you can turn it off in the Settings App or override it whenever you like. Setting the author for a drawing is much the same. We'll assume you drew everything, but you can override that with a tap on the author field. Enter a name, then tap the screen or Done to apply it. 1. Touch your profile icon in the Gallery. 2. Under the Accounts tab, enter your email address and create a password. We won’t share your email, it’s our way of contacting yours truly in the Concepts universe. 3. Confirm your email address via your email account. 4. Voilà, you’re official! 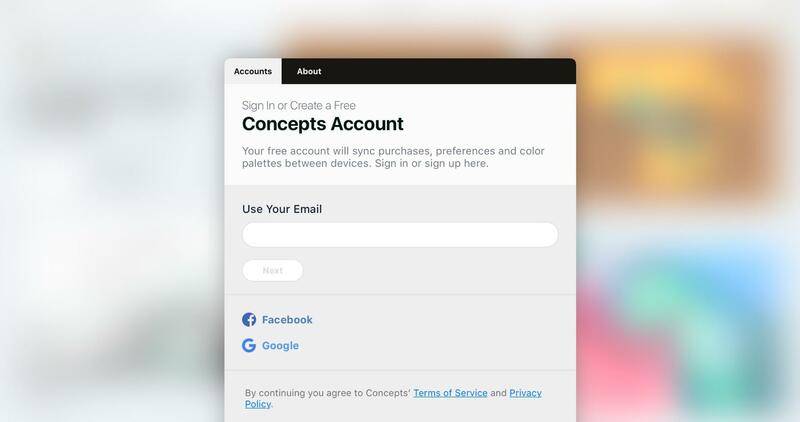 Your purchases, drawing settings, objects and color palettes will automatically sync between your devices. Create an object or update a palette on one device, and watch it sync live to your other device. 5. While you're on the accounts tab, would you mind telling us your interests? We'll know to create awesome content for someone just like you. 6. You’ll also see a new tab at the top of the overlay - Notifications. Go here to subscribe to our weekly newsletter filled with tips, interviews and cool stuff, and receive notifications when there’s something new to learn or we respond to your support request.